This quick and delicious slow-carb breakfast will get your day started off on the right foot and provide hours of steady energy. I often make this or a similar variation for our breakfast. I try to eat 30 minutes - 1 hour after I wake up. It yields for 2 people, but I take a larger portion so my wife gets about 2 eggs and I get 3. Source: I originally read about the slow carb diet in Tim Ferriss' book, The 4 Hour Body. It has a great deal of information on fitness, injury rehabilitation, diet and more. His other two books are also very interesting. Here is a link to his website if you want more information. I use almond milk to keep this dairy free but keep the eggs creamy. You could add any type of milk or cream, or just leave it out. 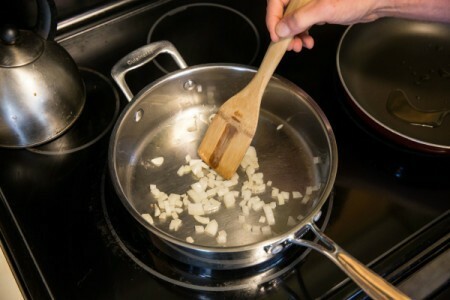 Add half of the grapeseed oil to warm sauté pan. 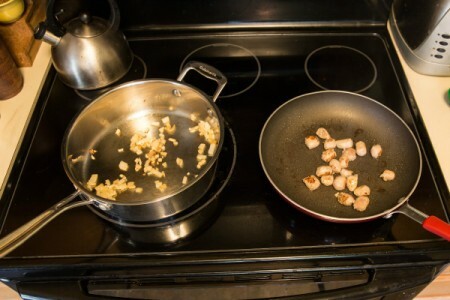 Sauté onions and garlic. Pour the rest of grapeseed oil into non-stick pan and add turkey sausage. I cut up my links into bite sized pieces so they mix with the scramble easier. 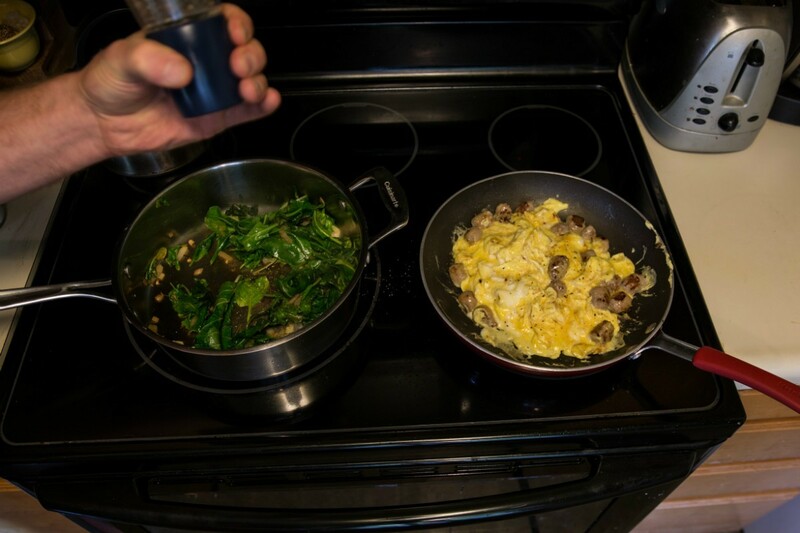 Add spinach, arugula and chard mixture to sauté pan and fold in with onions and garlic. 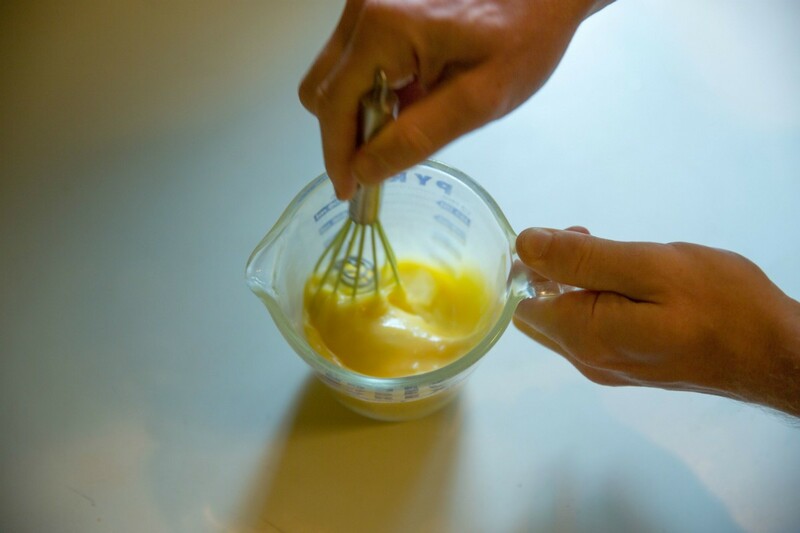 Whisk eggs and almond milk together. 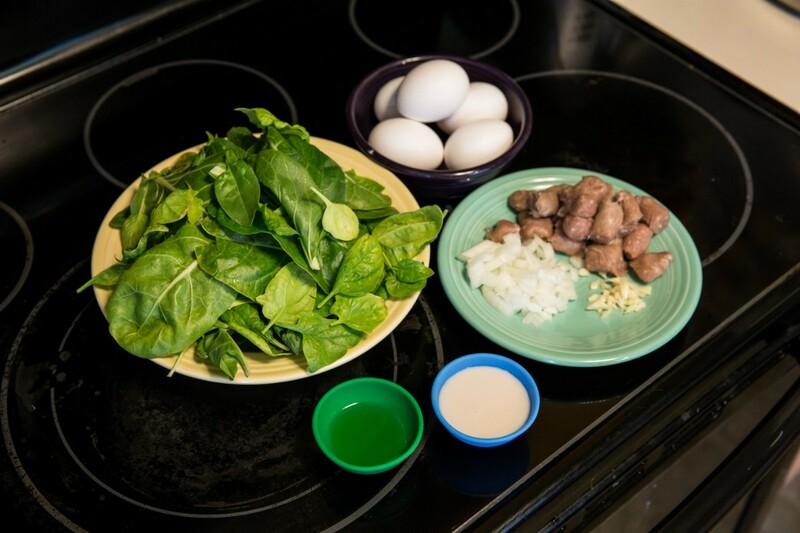 Add eggs to sausage pan and fold greens over again. 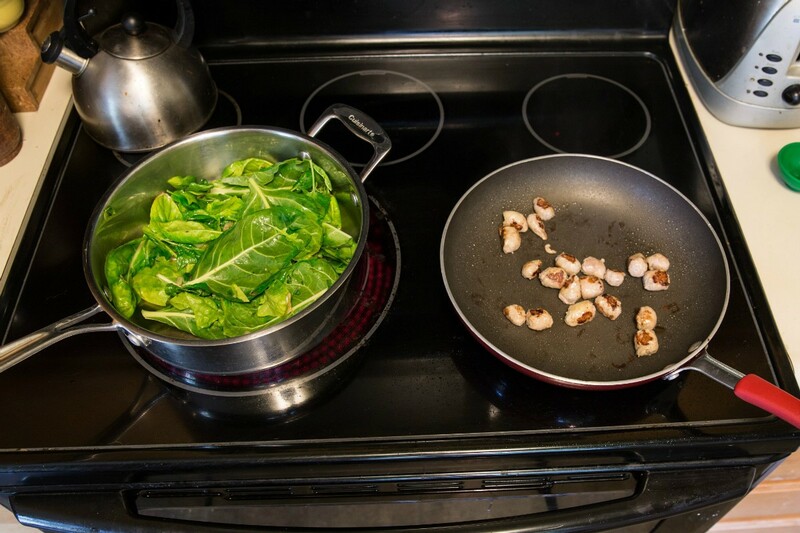 The moisture from the greens will start to deglaze the pan now. 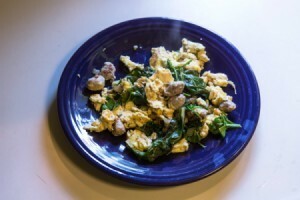 Scramble eggs in with sausage. Now is a great time to add salt, pepper and other spices you might prefer. 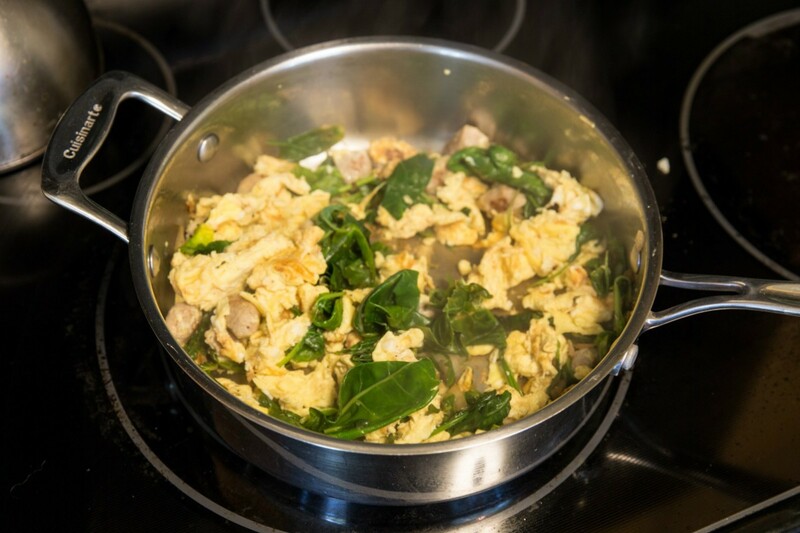 Move the eggs and sausage over to the greens pan, mix together and serve. We often add more spiced or hot sauces like sriracha to give it extra flavor but the onions and garlic do a good job on their own. My wife and I had been following the Slow-Carb diet for quite some time now. It's not for everyone but has been effective and surprisingly enjoyable. If you have any questions about the Slow-Carb Diet, feel free to ask them in the comments section below. Sure! 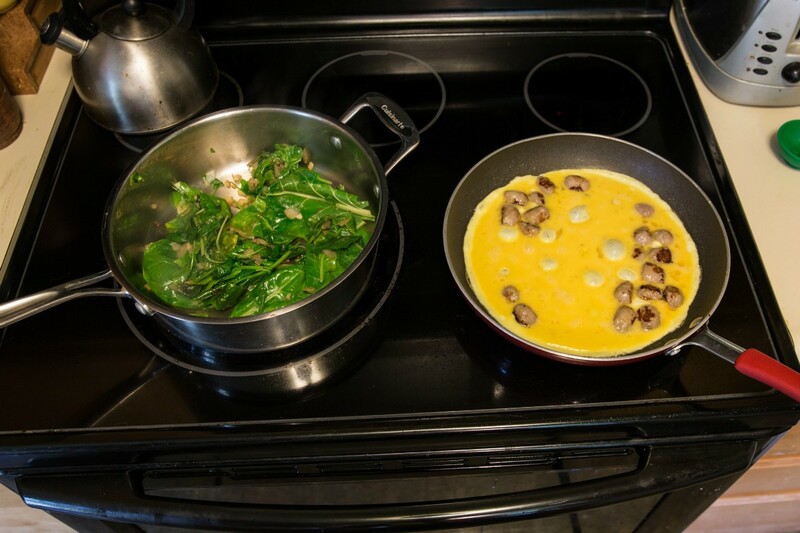 Slow Carb is somewhat similar to the Paleo or Whole 30 diet, focusing on protein and reducing carbs. No dairy, grains or sugars, including fruit; but you get one cheat day a week where you should eat all the things you have been avoiding. There is a lot of information online about this diet, from the Four Hour Body, by Tim Ferriss. My husband and I found it very effective. Beans are used in many slow carb meals. I often make a taco soup with ground beef, veggies and black beans. I would eat this for lunch, or a spinach salad with cooked chicken and balsamic vinegar as the dressing. For dinner, we could have a chicken breast, pork chop or steak with lentils and a green veggie. Or I would make a stir fry and serve it without rice or noodles. If going out, Mexican and Asian restaurants were the easiest to stay on plan with a few substitutions.